A word of warning about this report – it tells of damaged bicycles and fallen riders. Those of a nervous disposition should look away now. It was also unexpectedly cold! 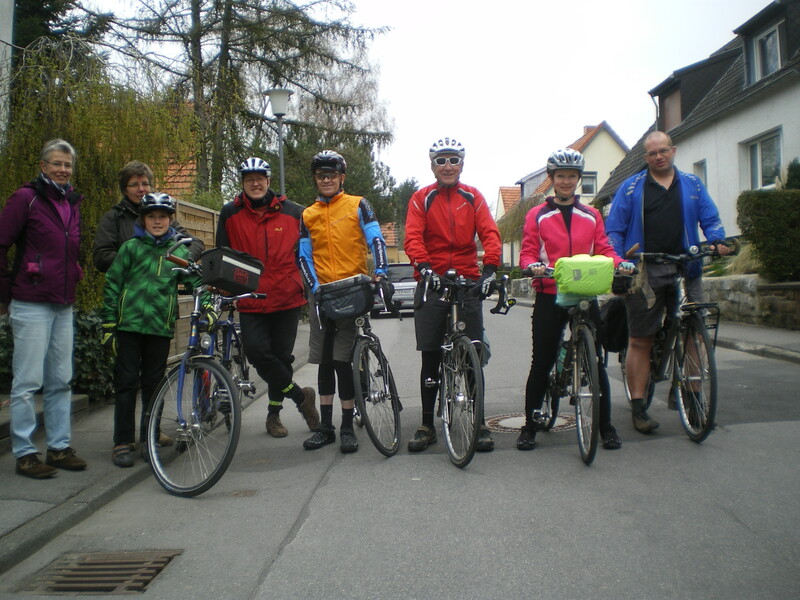 Our hosts had decided to join us for part of this trip – in fact they were to lead the first few kilometres – so Otto had saddled up the tandem with son acting as stoker and Elke was riding her trusty town bike (although it’s far more capable than that description suggests, and far quicker. Who needs 24 gears in town?). Ulrich had also joined us for the day. We were treated first to a visit to the Forst tree (that’s not a typo – it’s in the village/suburb of Forst), a lime tree that’s not many generations of Aacheners from its millennium and which has developed quite an impressive girth over its lifetime. Then we hit the trail towards Kornelimunster. For light relief, along the run in to Kornelimunster, someone has replicated the solar system, which is to say that, at appropriate distances (proportional to typical distance from the sun), there are plaques representing the planets of the solar system. Each plaque contains a proportionally-sized hemisphere and some basic information about the relevant body. It was a little disappointing to find Jupiter the size of a grapefruit while earth was a mere pimple but it served to put things in perspective. After Kornelimunster we hit another ex-railway line (other countries have had their Dr Beechings) which brought us to the Vennbahn and, eventually, to Belgium. In fact, the first part of Vennbahn that we rode runs through the German-speaking corner of Belgium. You thought they had problems because they have two languages? They’ve actually got three. What fun. It was somewhere around here that our hosts turned back towards Kornelimunster for Sunday lunch so Phil resumed leadership duties although Ulrich was still with us and was to act as our guide later on. 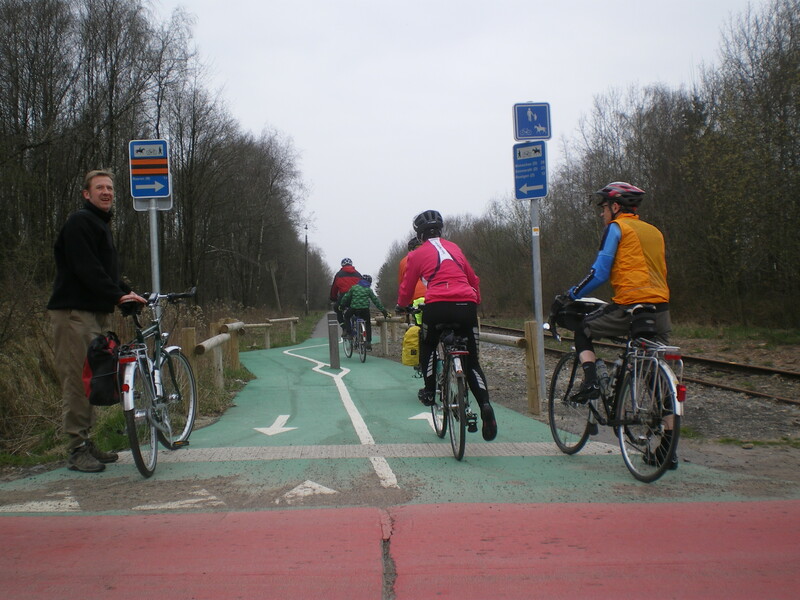 Ulrich, the Vennbahn cycle path, and bollards! The Vennbahn proper is a politically interesting piece of real estate. While it runs partly through modern-day Belgium and partly through modern-day Germany, it is, in fact and in law, entirely Belgian. That is to say that, although the rail line has German territory either side of it for much of its length, the trackbed and Right of Way are emphatically Belgian. The original plan was to stop for a coffee in Raeren but, since we were making good progress, we pressed on and stopped for a brief buzzbar/waterbottle stop in Roetgen. This may have been a mistake. A few kilometres later, and I’ll mention no names here, one of us was looking at a map when they managed to collide with a bollard. The rider behind swerved to miss them and ended-up sliding face-first down the bank at the side of the track. This was very worrying, and could have been very serious for the riders concerned but fortunately damage was limited to a few scrapes and bruises and a busted gear cable. It could have been so much worse. For future reference, please pay attention to your surroundings! Even when riding “easy” cycle tracks !!! 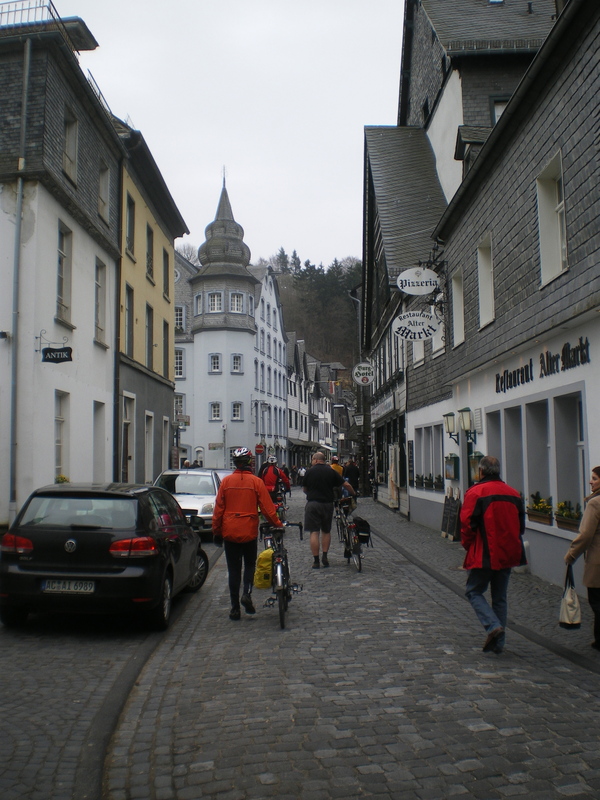 We continued in a more cautious mood to our day’s destination: Monschau, “Pearl of the Eifels”. What a beauty! Okay, the short, rapid, descent was welcome after spending the morning pushing up the gentle but persistent incline of the Vennbahn, and the cobbled streets were no longer a suprise, but the only adjective that springs readily to mind is “chocolate box”. I do so wish we’d had more time here. The village is small, set in a narrow valley, and it’s a tourist trap, but I’d have spent a happy day sitting outside or just wandering round looking at the place. Next time I’m bringing a sketch book. It was exceptionally cold but by this time we’d topped 2000′ in altitude and it was still April so that shouldn’t have been a surprise. We’d just got used to the unseasonably warm weather we’d been enjoying on the trip. After spending just a few kilometres inside Germany to drop down into Monschau and make our way back up to the top, we headed back into Belgium proper, through Mützenich, to cross the High Fen, where the red flags were flying not, as we suspected, because of military manoeuvres but to prohibit access to the open country in the interests of wildlife. We were okay, sticking to forest roads, although we did still need to take care as logging operations were very much in evidence and bits of tree were sticking out over the tracks. We looped around the reservoir that serves the Belgian town of Eupen, which looked rather low on water, and then through to more productive farmland. It seems that, despite differing traditions between the neighbouring countries, locals along the border don’t even really note that they’ve crossed the border these days. I suppose that the common currency and lack of border controls (or even lack of border signs) have blurred the boundaries somewhat. It’s no surprise that this piece of the continent is really at the centre of the “European Project”. Back in Aachen, we bade farewell to Ulrich, and to Phil and Rowan who were continuing their travels in Germany for a while longer. The Endomondo route for our ride is here – 56 miles. Tomorrow, we’d number four on the road. 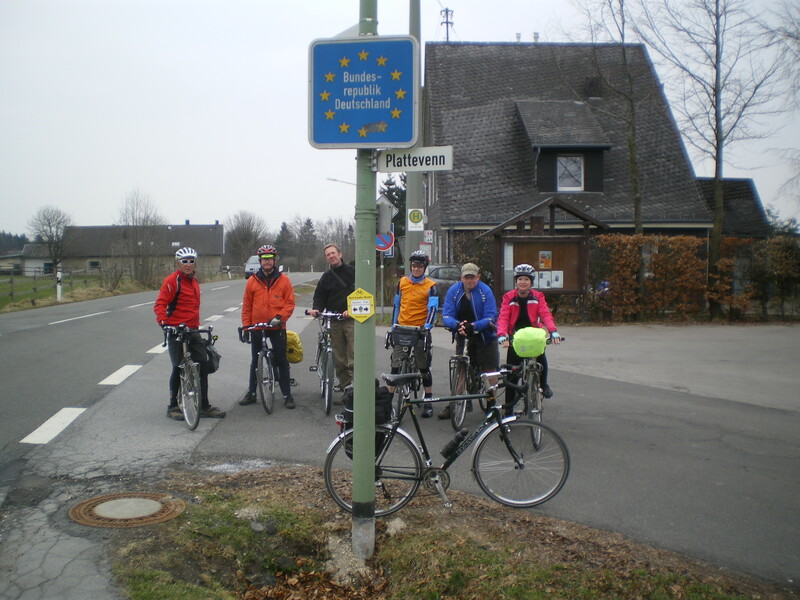 This entry was posted in ADFC, ADFC Aachen, CTC Northampton, CTC Tour to Aachen, cycling and tagged Aachen, CTC, Eifel, Monschau, Northampton, Vennbahn by ianmac55. Bookmark the permalink.